CS: What were some of your goals in editing and writing Governing Oregon? How did this book come about? Do you think it fills a gap in literature on Oregon politics? RC: There are just very few books on Oregon politics and the ones that exist tend to be biographies. But there is just not a lot out there. The last book to offer a comprehensive view of Oregon politics was published more than a decade ago, and it was structured much more as a textbook. Early on, the four editors got together and discussed what we wanted to do in writing a new edited book on Oregon politics. The one thing that struck us immediately was how much Oregon politics has changed over the past twenty years. We quickly decided we wanted to capture the change. But as we got talking, we also recognized that there were some central parts of Oregon politics that had not changed, such as the lack of a sales tax and the state’s unique kicker law. Thus, we came up with the subtitle of continuity and change. One of the things we did not want to do is to write a general textbook on Oregon politics. Instead, we wanted to capture some of the central characteristics that have defined Oregon politics since the beginning of the new millennium. We also wanted to be comprehensive. The result, I feel, is a much more dynamic and readable portrait of state politics than if we had gone the textbook route. I have to give credit to Ed Weber at Oregon State University for playing a central role in helping bring the book together. He was the one who called for the first brainstorming meeting. He also spearheaded a two-day workshop with all the contributors, which was underwritten by the U.G. Dubach Chair endowment at OSU. Of course, this was a real team effort. Priscilla Southwell and Mark Henkels worked diligently on different parts of the project. We also had a great group of contributors. CS: Governing Oregon highlights the polarization of political climate in Oregon and the divide between the rural and urban areas. What are some of the issues these areas are divided on and why is this essential to understanding Oregon politics? RC: It is impossible to talk about Oregon politics without talking about the state’s political divides, especially between the rural and urban areas. The divide we see in Oregon among the regions is similar to that in other parts on the country, though there are some specific historical events that were important in creating this divide in Oregon. We talk about these influential events in different parts of the book. At the root of the divide are economic and social differences between the regions. Since the early 1980s, many of the rural parts of the state have faced continuous economic challenges, while the urban areas have enjoyed considerable economic growth and diversification. Along with the economic division, the urban areas have grown more populous and more racially, ethnically, and culturally diverse. There are other differences that less frequently noted, such as in access to high technology and the media. Many of the contributors discuss this divide, but the chapter by Alexandra Buylova, Rebecca Warner, and Brent Steel on “The Oregon Context” does the most thorough job in explaining why we see this divide and how the divide, in turn, shapes the state’s politics. As they and other contributors point out, these social, economic, and cultural differences create different public policy issues in the different parts of the state while also generating different ideas about the proper role of government in society. The result is a profound split between the regions. We don’t just focus on the divide, though. One of the things that has changed in Oregon over the past twenty years is that the Democratic Party has become more dominant. Twenty or thirty years ago, the two parties were about evenly matched, creating conflict and gridlock in trying to govern the state. The polarization has not gone away. It is just that the more liberal side of the state—the parts electing Democratic Party candidates—has become more dominant. CS: In your chapter on “Changing Partisanship, People, and Pressures in the Legislature,”you note the changing demographics of Oregon legislature, which has been and still is dominated by middle/upper class heterosexual cis able-bodied white male legislators. What changes and constants have you observed in the composition of the legislature, and what are barriers to further diversity? RC: Yes, you are right, the legislature remains dominated by this demographic group, though there have been some significant changes. The most significant one has been in the number of women elected to the legislature. In the 1960s, there were fewer than 10 women in the legislature. Over the past decade, those numbers have grown significantly. Today, one-third of the legislators are women. Female legislators have also begun to control many of the top leadership positions, including serving as House Speaker and the majority leader in both chambers. There has also been some improvement in the representation of racial and ethnic minorities. The big change can be seen not in this most recent election, but in the previous one. During the 2017 session, there were four African-Americans, four Latinxs, and one Native American serving in the legislature. When you couple this along with the election of Oregon’s second female governor, it means that the state government has become more inclusive and representative. However, women and minorities are still underrepresented in Oregon government and there remain many barriers to improving these numbers. Some of this underrepresentation, especially among women, may reflect societal constraints placed on them, yet the challenges are also political. Women and minorities are often simply discriminated against in receiving financial and other support to run for office. CS: Governing Oregon notes how Oregon’s progressive energy policies set it apart from many other states. How did clean energy come to be a priority for Oregon? Do you think Oregon’s policies may influence other states to adopt similar policies? RC: Most of the nation’s attention has been focused on the federal government’s efforts, or lack of them, in addressing the environment threats we face. The reality, though, is that the vast effort to address these problems have been taking place at the state and local level. State legislatures have become the undisputed leaders in directing climate policy in America. One article I recently read said that it is as if the states have been on “steroids” when it comes to addressing climate change. Oregon was the first state to impose mandatory limits on carbon dioxide emissions on power plants. It has taken steps to encourage the production and use of cleaner, more efficient, renewable energy. These steps include establishing a Renewable Energy Action Plan, expanding efficiency standards for state-owned buildings, and creating a quasi-governmental organization to provide cash incentives and technical support to encourage private investment in renewable energy. The state has also adopted a ban on coal-fired power. While these are meaningful steps, it does not mean that there are not other important energy issues confronting the state. Among the big ones are the transportation of fuel, including proposals to construct liquified natural gas terminals and pipelines in the state. Even though the federal government has been slow to respond, state governments recognize that the problems associated with energy, the environment, and climate change need to be addressed. Whether or not other states directly copy the legislation enacted in Oregon depends in large part on how successful our policies appear to be in addressing these issues. CS: Governing Oregon addresses the destruction national and state governments have caused to indigenous communities, including the termination policy of 1953 in which Congress eliminated tribes as political entities. What are the current issues facing tribes today? RC: Justin Martin and Mark Henkels put together the chapter on tribal government and provide a brief history of the challenges facing tribes in Oregon, though much of their chapter focuses on how Oregon tribes have become leaders in developing positive relationships with the state government, one that is based on government to government relations. This approach has benefited Oregon tribes, enhancing the independence of their governments and allowing them to play a more assertive role in local, state, and federal affairs. It is a very interesting story. Of course, there are many challenges that still confront Oregon tribes. Justin and Mark focus particular attention on tribal gaming. The development of tribal casinos has helped Native American communities, improving job opportunities for tribal members and building tribal economies. Yet the future success of tribal gambling is not assured. Justin and Mark discuss some of the potential challenges that may affect tribal gambling in the future and reduce this boon in revenue and jobs. CS: This past fall midterm elections were held, and the incoming representatives elected to the House will be the most diverse class in history. Can you share your thoughts on the results of the recent elections in Oregon, and what do you anticipate the impact of these results will be? RC: The increase in diversity is important because it brings in new and different perspectives on the issues confronting the nation and the state, and it leads to different types of bills being introduced and enacted. As I mentioned earlier, though, women and racial/ethnic minorities remain underrepresented in Oregon, as they do at the national level, which means that while their concerns are being better represented, there is still much progress to go. The most significant impact the recent election had on Oregon politics is that it enabled the Democrats to retain control of the governor’s office, while expanding their hold over the Legislative Assembly. They now have a supermajority in both chambers, which means that they can pass tax measures without the support of any Republican. There are, however, some roadblocks that will limit the Democrats’ actions even though they have the supermajority. While the political parties have been acting more like cohesive teams in recent years, the Democratic legislators and their constituents still do not agree entirely on how every issue should be addressed, so some intra-party differences may stop the Democratic leadership from steamrolling everything they may want. Plus, opponents can always use a referendum, or a threat of a referendum, to restrain the Democrats. There is another roadblock too, which will limit what the Democrats can accomplish, and that is simply time. The legislature is only in session for a little over five months. As a consequence, the party leaders have to decide what issues to emphasize this sessions and which ones to hold off until later. In our book, we talk about the conflict and gridlock that frequently threw Oregon’s government into chaos in the 1990s, making it difficult to govern the state. Despite the potential roadblocks that may limit the Democrats’ success in the current legislative session, the party’s success at the polls last year puts it in a strong position to get what it wants and to avoid the conflict which once hobbled the government. 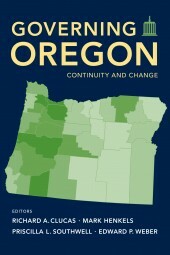 Buy Governing Oregon: Continuity and Change here and read more about the issues Richard discussed with us today! Richard A. Clucas is Professor of Political Science at Portland State University and the Executive Director of the Western Political Science Association. He is a co-editor of and contributor to Governing Oregon: Continuity and Change.